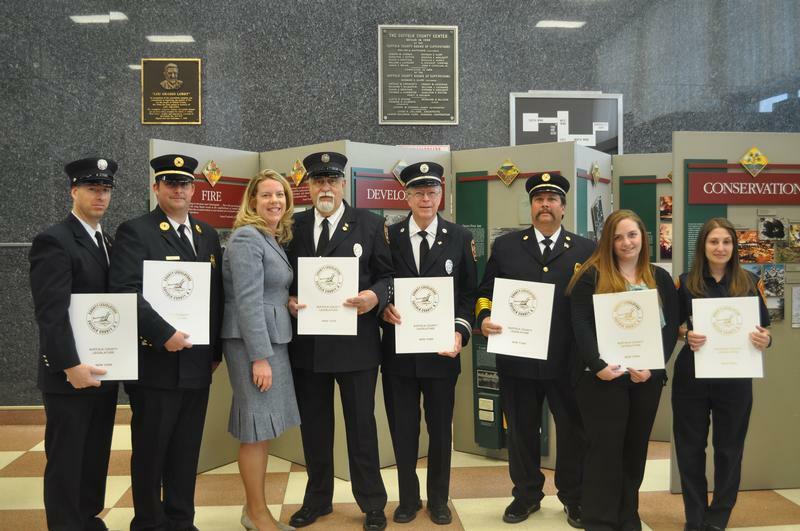 On March 29, 2014, nine members of the SBFD were recognized by Suffolk County Legislator Kara Hahn for their efforts in delivering premature twins. On March 11 SBFD responded to a call for an expectant Stony Brook mother who was in active labor with twins. When the responders arrived they found the mother about to deliver the first child who was not breathing and required life saving procedures to restore his breath. Shortly thereafter, the SBFD crew delivered a second baby who was initially presented in a breach position. This child also required medical intervention to restore breathing. The mother and her twins are now doing fine. The members of the SBFD crew receiving the awards were: Rich D’Agostino, Vinny Franco, Mike Gallagher, Ron Gilone, Krista Marzano, Kevin O’Leary, Chris Schwenker, Rich Scriven, and Eric Weissbard.